Define your wet-fly casting zones to prevent angler frustration in a drift boat. When it comes to drift boats I spend the majority of the time rowing one. When I get the opportunity to fish out of one, I will most likely be fishing from back of the boat — on the upstream side. My seating position is not out of choice but remains a factor of weight. Drift boats are easier to handle with the heaviest angler in the downstream seat and since I’ve weighed the same 135-lbs since high school, I inevitably end up in the back of the boat. As a down and across, wet fly fisherman, I have often found my blood boiling as the angler in the front of the boat, lines over the limited water I have to fish from the upstream seat. This past spring on the Muskegon River, in Newaygo, Michigan, we arrived at the take out point along with a flotilla of various other drift boats and jet sleds. As we packed up the boat and exchanged tales of the evening with other anglers in the parking area, a long conversation ensued with a couple of doctors who were skilled dry fly fisherman but new to swinging a wet fly. I can’t tell you enough how I could have just hugged that man right there – in a way that one man can hug another man and still be a man. Homophobic jokes aside, I was truly ecstatic. SOMEBODY out there shared my pain. If I had a nickel for every time another angler lined over the only rising fish I could cast to while setting up their swing, I could go to New Zealand, Patagonia or the Bahamas on the nickels of other anglers. Over the years I have dropped subtle, and not-so-subtle hints to various anglers about lining over my water and it seems to mostly fall on deaf ears. I’m convinced that the miscommunication is not because I fish with a collection of selfish, uncaring anglers (because I don’t), but due to the fact that they have never fished from the upstream side and have no comprehension how limited the fishable water is from that position. As such, I have embarked on creating the definitive, casting-zone maps for wet fly fisherman. By all means, feel free to print out these diagrams, laminate them in plastic and keep a dozen copies in your boat. With any luck, they will resolve problems before they become a problem. Having been to the edge of madness where I considered beating the front-of-the-boat angler with an oar, I figure this is my small attempt at saving lives on the river. Figure #1 ~ Proper cast and swing zones. If the above angles look confining (figure #1), remember that they extend to the maximum length each angler can cast and still manipulate a fly and set a hook. The green area below the downstream, front-of-the-boat angler increases exponentially as they cast further and the zone represents the optimum angle of a wet fly swing’s “hot zone”. The illustration below (figure #2) represents what normally happens in a drift boat. 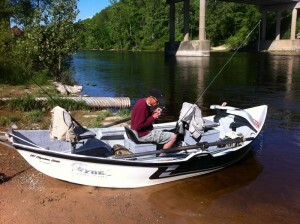 In the downstream anglers mind, they are fishing the water below the boat — as they would fish and cast while wading. From their perspective, they are fishing the way they normally fish and have little concept of how damaging it is to the angler behind them. As you can see, the downstream angler has effectively reduced the fishing area of the upstream angler to half a boat length or less — with regards to water that has not lined over. 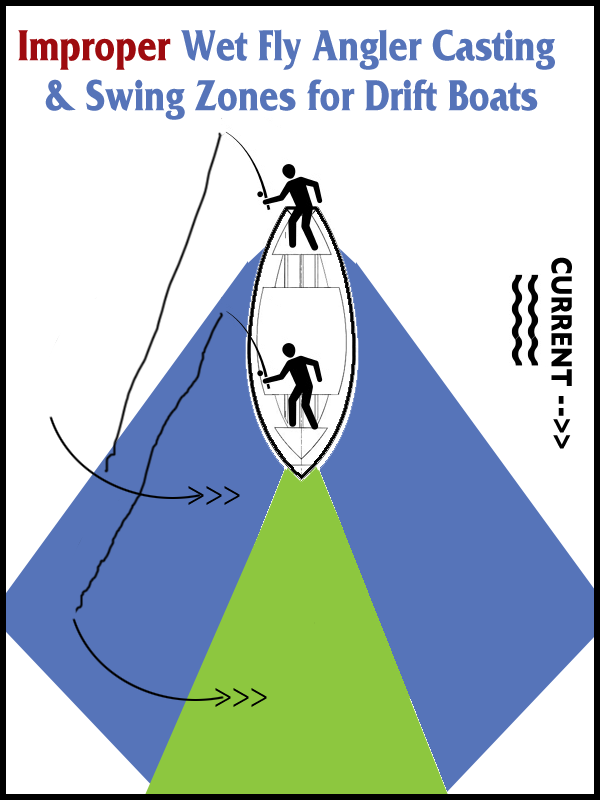 Figure #2 – Improper Use of Casting Zones in a Drift Boat. If you happen to be the the front-of the-boat angler and fishing wet flies, understand that you cannot swing a wet fly the way you normally would without ruining the day for your upstream partner. Keep your angles tight. Enjoy the quality water you have to fish and keep your line downstream — it just may save you from an oar beating or get you future invitations to fish. July 19, 2013 in All Articles. ← Gnats and the French Vanilla Whore.